Translated from the original German by Dr. Robert T. Firestone (ret.) University of Colorado, Boulder, CO Department of Germanic and Slavic Languages. 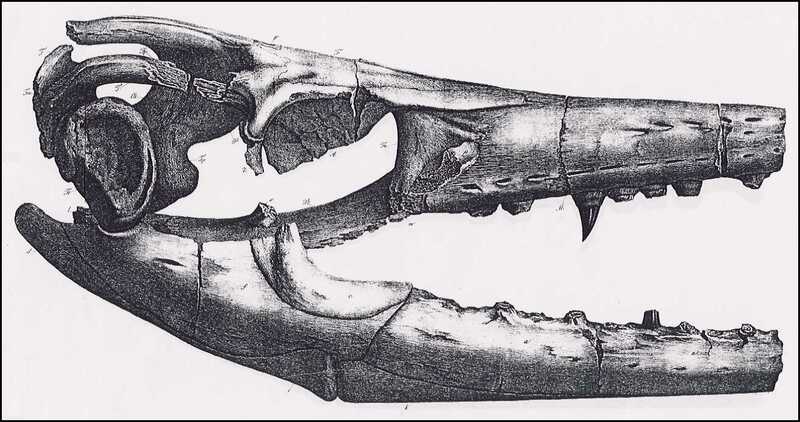 Wherein Dr. Goldfuss describes the skull of a mosasaur found along the banks of the Missouri River in South Dakota in the 1830s and sent back to Germany by Prince Maximilian zu Wied. At a conference of the Natural Scientists in our city I have already had the honor of displaying to the Geological Section the fragments of a fossil skeleton, encased in stone, which His Highness Prince Maximilian zu Wied had presented to our museum as a highly valued gift. They had been discovered by Major OFallon, former Agent of the Indian Nations of the Upper Missouri, between Ft. Lookout and Ft. Pierre. *) They were brought to St. Louis and placed in the garden of their owner at that time. **) The bones were encased in a very hard fine-grained, dense limestone several inches thick, which in the interior of the larger pieces is bluish gray; closer to the exterior it is ocher yellow and softer, and on the surface black and bituminous. Where the stone covering of the bones is thin, it is completely black and bituminous. The skeleton was buried very slightly below the slope edge of the mountain stratum, whose smooth, partly polished surface could be distinguished by the fragments of the opposing fracture-surface. Here and there parts of the skull and vertebral processes projected out from the rock and were slightly weathered, and partly broken off, and coated with coal dust. *) The Journey of Prince Maximilian zu Wied to the Interior of North America. I. p. 348. **) Loc. cit., II, p. 78. The bones, completely encased in stone, are impregnated with fossilization matter, dense, hard and brittle. The stone block, over two feet long and thick, which contains the skull, had been broken into several pieces, whose undamaged fracture surfaces could be fitted together, however, and the vertebrae of the extended vertebral column, approximately 12 feet long, were in several cylindrical pieces. In the larger pieces there are very many crushed shells of larger and smaller species of the genus Inoceramus. The smaller ones can be identified as Inoceramus Barabini, and In. alveatus Morton *); the larger ones are large shells of Inoceramus Cuvieri. Since large Baculites **) are also found in those mountain ranges, there is no doubt that the rock belongs to the Cretaceous formation . This extends, as Morton ***) remarks, between the Mississippi and the Rocky Mountains; it forms the hills on the banks of the Upper Missouri, §) which resemble towers and ruins, similar to those in the Elbe valley near Dresden, and it contains a quantity of large gypsum crystals §§) as in Silesia. On top of it is a layer of bituminous brown coal, which can be seen extending several hundred English miles in the hills along that river (the Missouri).§§§) The bituminous character and the coal dust clinging to the projecting parts of our skeleton allow the assumption that it was covered by the coal stratum. *) G. Morton. Synopsis of the organic remains of the Cretaceous Group of the United States, page 62, tab. 13, fig. 11; tab. 17, fig. 3 and 4. **) Prince M. von Wieds Journey, I, pp. 331-349. §) Prince v. Wied Journey. I, pp. 331-349. §§) Loc. cit., p. 333.
could only be chipped off with a steel mallet. Since moreover the bones are much more brittle, no force could be applied during their uncovering, and therefore this difficult labor achieved the desired result only after a number of years. It was ultimately possible to disclose the skull in a reasonably complete form. Only the tip of the snout and the zygomatic arches are missing, as well as the temporal bone, and the tympanic bone and the mastoid bone of one side. The two rami of the lower jaw could not be completely freed from the stony covering, and its chin symphysis is likewise not present. The vertebrae of the spinal column lie mostly in a continuous row next to one another; however, the processes protruding outside the stony cover were more or less shattered, or they crumbled at the attempt to free them from the stone. Here and there short pieces of ribs were found. Only a few small fragments of the extremities, the pelvis and the shoulder-blade were present. *) Cuvier, Oss. foss., page 310, tab. 18, 19 20. 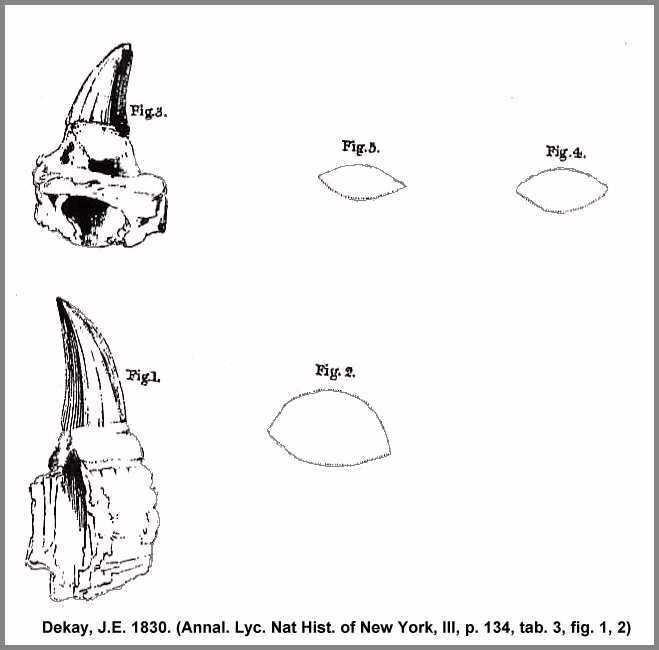 **) It can not be determined whether the dental remains from the Cretaceous of New Jersey as illustrated by Dekay (Annal. Lyc. Nat Hist. of New York, III, p. 134, tab. 3, fig. 1, 2) differ from those of the Maastricht specimen or not, based on its size, which seems to be predominant, since our museum owns a tooth from St. Petersburg, which is also 5 inches in length, including the socket. Since the end of the snout of both the Maastricht skull and our own has been lost, no specific difference can be determined by the number of jaw teeth. In both eleven teeth remain on each side of the maxilla. In the complete lower jaw of Mosasaurus Hofmanni there are 14 teeth; in each of the broken-off rami of the mandible of the American specimen there are only eleven. In both specimens the tooth crowns, which are covered by a brown shiny enamel, are seated on a dental capsule which has been modified into an ossified base which has grown into the alveoli. Some of these capsules are hollow on the inside, and some are filled up. The bases and their alveoli extend down over 2/3 of the total height of the walls of the jawbone, and the replacement teeth are breaking through laterally in the interstices. Likewise the tooth crowns of both species are slightly compressed laterally (Plate IX, Fig. 4), and at the tips slightly curved towards the back and divided into two halves by a sharp straight ridge (Plate IX, Fig. 6), which is cross-striped and finely serrated, the inner part somewhat larger than the outer part. Its surface is polygonal, as on the outside five and on the inside seven pyramid-shaped surfaces of unequal size can be seen, which are already taking shape in the small replacement teeth. On the other hand the pterygoid bone has two distinctive features. In the Maastricht skull its tooth edge clearly curves downward towards the front and has only 8 teeth. In our skull, however, this edge is not perceptibly curved, and it holds 10 teeth. in honor of Prince Maximilian zu Wied, a scientist, well known for his travels to Brazil and North America, who rescued these remains from destruction and who transported these heavy masses of stone thousands of miles to us here, in order to present them to a German museum for the purpose of scientific study. The appended drawings (Plates VI, VII, VIII) depict the skull in its natural size, following precise measurements; therefore, the specific indications of its dimensions are unnecessary, and are also superfluous because the missing nose tip prevents the determination of the total length and comparison with other skulls. But even lacking the determination of precise relative dimensions, this skull is still complete enough to provide the knowledge of its genus. The low, elongated shape of the front of the head, the narrow, long nostrils, the formation of the mandible and the presence of palatal teeth confirm Cuviers statement, that this genus of animal must be assigned to a place in the classification between the Monitors and the Iguanas. But if we proceed to examine the individual parts of the skull structure, we are surprised to find here a common center in which are combined not only the properties of the two genera mentioned, but also of most other saurians; however, a number of features remain which belong to this species alone and distinguish it from all others. It is to be supposed that the tip of the snout shares similarities with that of the Monitor, that it therefore was broken off shortly before the widening of the intermaxillary bone. One can judge the size of the narrow nasal process of this bone by the distance between the nostrils (Tab. VIII. Jm.). At the back it is so closely grown together with the adjacent simple nasal bone (N.) that one can not recognize its boundary on the somewhat damaged surface. It was simple, not doubled, as A. Camper had supposed. The narrow nasal bone (N.) is connected with the medio-frontal bone by three deeply cut prongs. The long nostrils are similar to those of the Monitor, but narrower by half and somewhat shorter. At the anterior end they dwindle into a narrow furrow; in the first third of their length they widen, then become a bit narrower, and their posterior end is rounded, while they are pointed in the Monitor. There is no trace of the spoon-shaped opercular bones, which in the Monitor close off the front half of the nasal cavities. openings also turn frontward. In Cuviers drawing of the broken maxilla (Tab. 18, Fig. 1.h.) only one of the holes of the lower row is indicated, but on the plaster cast of the skull some of the upper row can be detected. The tooth edges are one inch wide, and are bordered inside and outside by a furrow. The oval bases of the teeth press up against one another at their inferior end. The front two were split longitudinally by the fracture, and reveal that the jaw bone is penetrated through 2/3 of its height by the tooth holes. These appear to be the front-most teeth of the maxilla. The zygomatic process of this bone (m.) was broken off along with the zygomatic bone, and it was so low that it could not contain any tooth sockets, as in the Monitor, and could serve as a base for only a narrow zygomatic bone. The medio-frontal bone (F.) does not consist of two bones, as is the case in the Monitor, and its rear edge is not straight, as in other lizards, but it is a simple, smooth, inverted delta-shaped bone, whose anterior and posterior points are cut off. In its center line it has a low ridge which quickly flattens out toward the back. Its long, almost straight edges converge towards the serrated portion of the tip, which adjoins the nasal bones. The blunt point, which would be formed by the converging shorter posterior side edges, is carved out in a semicircle, and this cut-out is also shown in A. Campers drawing of the inner surface of a frontal bone from Maastricht (Oss. foss. tab. 20, fig. 1). At the anterior end one can make out a fine crack, the trace of a separation into two halves which existed in a juvenile stage. Also, fibers of this bone radiate towards the back from two points on the sides. (Fp.) by means of a long process, so that the two encircle the medio-frontal bone (F.) and form the rim of the orbit. A small cut out (fa.) near its posterior end is an indication of the hole which in the Chamaeleo bifurcus is found between the process of the anterior frontal bone and the medio-frontal bone. As the anterior third of the orbital rim, it forms a projecting edging, descends vertically at a right angle, at its lower edge it makes some large creases in order to approach the lachrymal bone, and bends with a curve to form the anterior wall of the orbit. The lachrymal bone (L.), which lies between the lower edge of the anterior frontal bone and the zygomatic process of the maxilla, is very narrow, a longish rectangle of a small size, and it is broken off above the tear duct. It descends steeply from front to back, forms a bumpy surface, and at its inner edge it has a cut-out, bordering on the large opening which is formed by the adjoining bulge of the anterior frontal bone. the other lizards, and their exterior surface slants so slightly downward that it is almost horizontal, and through this peculiarity identifies the genus. The temporal areas of the parietal bone descend so steeply, like a sloping roof, that the dome of the skull within the temporal cavity has a lateral diameter only half as long as that of the Monitor; indeed, it is even smaller than in Istiurus and Iguana, and, moreover, it narrows towards the back. The posterior frontal bone (Fp.) abuts the posterior external corner of the medio-frontal bone and the outer edge of the frontal surface of the parietal bone. Its zygomatic process is narrow, and there is a small fragment of the zygomatic bone (Z.) still attached. The temporal process on its outer surface slants toward the exterior, and as in the Monitor it is received by the forked opening of the temporal bone (T.) The boundary of this insertion is indicated on the exterior by a groove. The existing piece of the zygomatic bone reveals that the zygomatic arch was closed and very narrow and weak, as is also demonstrated by the broken zygomatic process of the maxilla. The orbital opening which is enclosed below by the zygomatic bone is oval, twice as long as it is high, and much lower than in the Lacertia, for which reason the superciliary bone (os superciliare) is lacking. The large eye was surrounded by a bony ring whose large plano-convex plates lie in the right orbit, shoved on top of one another. The mastoid bones (Tm. ), the continuation of the bony arches of the temporal bone, have their outer surface inclined upwards, as does the temporal bone, but they assume a vertical direction at their connection with the mastoid process of the petrosal bone (Tp.). framed by rough bulges, and with its posterior edge it abuts the mastoid bone. Its outer tip is broken off, along with the ends of the lateral occipital bone and the mastoid bone, which converge here. Since the temporal portion of the parietal bone extends far downwards, the petrosal bone (Tp.) is shorter than in the Monitor, and also the lower wing of this bone, which is directed forward to close off the skull cavity, has a shorter length, but a considerable thickness. The extraordinary shortening of the dome of the skull, as well as its narrowing, is also notable. The edge of the superior occipital bone (Os.) is compressed from both sides to such an extent that it forms an acute-angled roof, whose peak is shorter and drops off more steeply than in the Monitor. The body of the basilar bone (Ob.) is narrower and shorter by one third than in the Monitor. In its relative dimensions it resembles that of the Istiurus, it is also concave underneath, and has pronounced gnarls before its anterior end.. The body of the sphenoid bone is covered by the pterygoid bones and appears to have been partially lost. The occipital foramen is a transverse oval, proportionally smaller than in the Monitor, and filled with a very hard pebbly stony mass. The lateral occipital bones (Ol.) show no notable differences from the structure of the Monitor. The two pterygoid bones (Pt.) have the same characteristic form as in the Mosasaurus Hofmanni. They are slender, as in the Monitor, but they bear teeth like those of the Leguane anolis and Lacertia. In front they narrow to a point and attach to the inner edge of the palatine bones (Pl. ), and they reach the vomers with their tips. in our collection (Plate IX, Fig. 5) also has the same sharp, finely serrated and cross-striped ridge, but it is, by the way, smooth and not divided into pyramidal surfaces. In its posterior half the pterygoid bone divides into three processes, which in our drawing (Plates VII, VIII) are given the same letters used by Cuvier. The first process (o. ), which points outward, connects with the transverse bone. It is rounded off and even narrower than in the Monitor, whereas in the other Lacertia it descends with a fairly wide wing shape. The middle one (l.) forms the process of the pterygoid bone to the tympanic bone, and the lower one (m.) is a continuation of the dental edge, and contains the base for the pterygoid process of the sphenoid bone. The tympanic processes diverge towards the back; they are compressed from both sides, higher and thinner than in the Monitor, and their outer surface is directed down and a bit inwards. Only one of these is preserved; the other is broken off. The lower wing (m.) is lacking on both sides, so only the fracture surfaces (m'.) can be seen. In other lizards it forms only a stump below the depression of the sphenoid process; but in Istiurus pustulatus a slight lengthening shows up. connection with an apophysis. The length of these bones is 2 ¼ inches and their width is one inch. They are either greatly elongated joint nodes of the sphenoid bone for the reception of the pterygoid bone, or they are the columellae. However, they do not have the necessary length to be the latter, and one would have to assume that they were extended by an apophysis. Their considerable thickness would be in accord with the weight of the occiput, for which they were to serve as a support. The transverse bone is absent. The boundary between the intermaxillary bone and the vomers (V.) is not obvious. The latter are narrow, separated by a narrow groove, and they extend into the area of the fourth molar, where they meet the narrow processes of the palatal bones (Plate VIII, Pa.) These do not diverge farther from each other than the vomers; they are narrow and broken off at the back, at the edge of the orbit. They resemble those of the Monitor, but have a greater width, are closer together, and their outer edge joins with the maxilla to a greater extent. The inner nasal cavities also resemble those of the Monitor, but are narrower and shorter. In the Monitor they extend to the edge of the orbit; in this specimen they end parallel to the exterior edge of the lachrymal bones. The boundary between the vomers and the palatal bones is not visible. The tympanic bone (Plate VIII, Tt.) on the left side was shifted, and cemented to one branch of the mandible. Though it could not be completely freed from the stony crust, one still sees that it is shell-shaped and similar to that of the Maastricht animal. The curved process at the upper exterior corner is not visible and is probably broken off. The two rami of the mandible, which are broken off at the chin symphysis (Plate VII), agree in their outlines and in their structure with those of Mosasaurus Hofmanni. They could not be completely freed from the rock. There seem to be 10 teeth on each ramus, and 4 teeth were thus probably lost with the broken-off piece, since the Maastricht specimen has 14 teeth. The number of the nerve cavities can also not be determined. In both species of this genus the mandible most resembles that of the Monitor; it is low, elongated and has low lying joint surfaces. However, the end process of the articular bone (d.) is shorter; the coronal process lies farther back and is not formed solely by the coronal bone (c.) [= coronoid], for the supra-angular bone (e.) extends all the way up to it and provides a considerable breadth towards the back. The alveolar bone (a.) [= dentary] is cut off at a slant at its posterior edge, in a straight line from front to back. The most prominent characteristic of this jaw, also seen in the Maastricht specimen, is the pronounced protrusion of the opercular bone (b.) [= splenial] on the outer side, where it meets with the angular bone (e.) in a vertical line. Their suture lies in a groove which follows the outer boundary between the two bones to the front and the back. In Cuviers drawing (Tab. 18, Fig. 1) this is covered by the fragments of the maxilla, which lie on top of it, but it is clear in the plaster cast. anterior frontal bone to a similar degree is found in the skinks and the Iguanas, and in the chameleon this bone joins the posterior frontal bone, as in this specimen, to form the orbital rim. *) The Istiurus has a similarly shaped, gnarled lachrymal bone, and in Iguanas and Chameleons these bones are also of a relatively small size. The zygomatic arch is just as narrow and weak in Anolis and Podinema, and the Istiurus is characterized by a similar parietal bone with a very short frontal surface. Palatal teeth are found in Lacertia, Iguanas and some Skinks; there is a shell-shaped tympanic bone in Thorictis crocodilinus, and a greatly abbreviated occiput in the Leguanas. Given this manifold agreement of characteristics with other genera, there remain the following features which are not found in other saurians, which are thus characteristic for this genus. 1) The opercular bone of the mandible projects out farther on its outer side than in any other genera. 2) The teeth are not wedged in, but have grown into the alveoli through their sockets. 3) Above the row of nerve openings on the dental rim of the maxilla there are two additional rows of similar openings. 4) The medio-frontal bone does not form a straight line at its posterior edge, but rather narrows to a point, and in an opening at its tip it receives a spoon-shaped process of the parietal bone, which is pierced by the frontal opening. 5) The orbit is longer and lower than in the other Lacertia. *) According to a letter from von Meyer, he discovered the same structures in his genus Metopias, from the Upper Triassic sandstone [Keuper] near Stuttgart, whereas it is not the case in Mastodosaurus and Capitosaurus, which belong to the same family. 6) The narrow mastoid bone and the mastoid processes of the parietal bone lie flat, so that their broad surface is facing upwards. 7) The pterygoid bones stand crowded together to the end of their straight, almost parallel rows of teeth; their wider surfaces are directed towards the outside and the inside. They bear the rows of teeth on their inner edge which protrudes downward, and they have a third process parallel to the tooth edge. 8) The temporal bone makes a horizontal triangular widening at its posterior end, and abuts the mastoid bone only with the posterior edge of this triangle. 9) Lastly, the brain cavity is much shorter and narrower than in any surviving lizards. Of the spinal column of our skeleton 87 vertebrae are preserved, which together have a length of 13 ½ feet, and in their form they closely agree with those of Mosasaurus Hofmanni, which are well known through Cuviers description and illustration. *) The transverse processes of the thoracic vertebrae have only one joint surface for the reception of a simple rib head, and the caudal vertebrae differ from those of other saurians in the lack of the articular processes and in the fusion of the haemal arches with the body of the vertebrae, as is the case in fishes. The total number of the vertebrae can not be determined from the existing remains, any more than Cuvier could do so for Mosasaurus Hofmanni. To be sure, several series of vertebrae in their natural order were associated with one another by their mode of burial; however, gaps are apparent between them, and the last vertebrae of the tail are completely absent. Of the atlas only one bowed piece is present, cemented to the skull next to the occipital foramen. Above it is an unidentifiable centra-like body, which might perhaps belong to the axis. Then follow nine similarly shaped vertebrae which gradually increase in size, of which the last seven were connected in a series. Their centra are longer than wide, and wider than high. Their spinous processes slant backwards only a little; the same is true for the horizontal transverse processes, which have less thickness in the first two vertebrae, and which are compressed from top to bottom. In the following vertebrae these processes gradually increase in thickness, and they are compressed from front to back. The have four articular processes. In the first two vertebrae the anterior articular processes are distinguished by a considerable length. In the middle of the lower side of the centrum there is a short pointed spinous process, increasing in size up to the third vertebra, then decreasing again, until at the 8th and 9th it is reduced to a pair of low bumps. It is not perfectly round, but compressed at the base. In the Maastricht remains Cuvier found a connected series of eleven such vertebrae with a simple inferior spinous process (Tab. 19, Fig. 1. ), but not the two with the doubled bumps; thus the number of this division of vertebrae increases to 13. Of these 13 vertebrae only four belong to the neck, if, in accord with the structure of the Monitor, four vertebrae without ribs follow the atlas and the axis. In our skeleton thus only the third and fourth cervical vertebrae are complete, and the last two are missing, as well as the first two thoraco-lumbar vertebrae. and was therefore forced to include a part of the caudal vertebrae among the thoracic vertebrae and to assume that only a few of these latter had articular processes. Because of this assumption the location of the pelvis became doubtful. This doubt is now resolved by the present specimen. There are specifically 24 thoracic vertebrae with no spinous processes or bumps. If one then includes the other nine vertebrae which do have inferior spinous processes, that makes a total of at least 33 thoraco-lumbar vertebrae, while the Monitor iavanicus has only 22. Lacertia ocellata has 25, but Scincus variegatus has 37 of them. The heavy traverse processes of the whole series lie horizontal and at right angles to the axis, and decrease gradually in size, whereas the spinous processes achieve a greater width. All the thoraco-lumbar vertebrae seem to have supported ribs, as in the Monitor, so that the lumbar vertebrae can not be differentiated. ones following. Cuvier indeed counts 38 vertebrae of this type, though he suspects (loc. cit., p. 334) that this unusually large number might not come from one individual, but from several. Accordingly, the number of the anterior caudal vertebrae remains indeterminate. The vertebrae of the subsequent fourth series, those of the central section of the tail, still have small transverse processes which gradually become shorter and thinner, but they differ from the preceding by the presence of the chevron bone, which is located at the center of their lower side, and not on their posterior end, as in the Monitor. In the remains of our specimen there is a series of 22 similarly shaped vertebrae, all of which have a haemal arch. It cannot be determined whether this bone was articulated or, as it seems, if it was fused in all of the vertebrae. This series is found in 8 pieces of rock, whose surfaces match neither one another nor the preceding rocks, so at least 8 vertebrae are certainly missing. Accordingly, the medial tail had at least 30 vertebrae. Their spinous processes are narrower than in the preceding series, and in the last few they assume a vertical position. At the beginning the chevron bones point downwards at a right angle, but gradually assume an acute angle closer to the centra of the vertebrae. Maastricht specimen. In our remains only 19 were found, in seven unconnected pieces of rock, of which the two last are smaller by half than the preceding ones, which accordingly indicates a large gap. Following Cuviers count, 25 vertebrae would be missing. The vertebrae of the tip of the tail, in which the chevron bone is also absent, so that they retain only a spinous process, are completely lost in our skeleton; even Cuvier found only seven of them. Thus by the examination of our skeleton, at least the number and shape of the cervical vertebrae, of the thoracic and anterior caudal vertebrae, are established more precisely, as well as the situation of the pelvis. Vertebral Column Atlas and axis 2 --- 3? 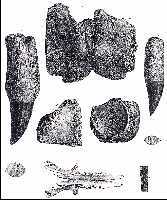 Some small fragments of ribs, imbedded in the stone next to the vertebrae, are also cylindrical in shape and striped, as in Mosasaurus Hofmanni. Of the bones of the extremities also only scanty remains were found. Two pieces of bone, fused together (Plate IX, Fig. 1) which form an angular slanting joint surface, are parts of the scapula and the coracoid (Oss. foss. Tab. 19, Fig. 15). On the inner surface depicted here one recognizes the coracoid (b.) by the foramen above the joint surface. The two bones meet almost in a straight line, and they are broken off at the common segment of the superior edge. On the outer side, which could not be completely freed from the adhering stony mass, one can see the distinctly elongated portion of the process which lies nearest to this opening. The coracoid thus appears to have only one cut-out, as in the Lacertia and skinks, and not two, as in the Monitor. The common joint in the bones also shows a longer neck and is thicker than in the Monitor. with the size of the skull and vertebrae, these remains of the extremities are rather small. If we attempt to draw conclusions about the living conditions of creatures of this species from existing data concerning the discovery site and the structure of the skeleton, we can be certain only that they were sea-dwellers and mighty carnivorous predators. The first is shown by their place of burial, in Cretaceous formations which were deposited in the sea. The latter is clear from the characteristics of their teeth. Everything else can be inferred only with greater or lesser probability. which is always found undamaged, would have been damaged and worn down. Thus their feeding was limited to cartilaginous fish. In their era rays and sharks were so numerous in those waters that they had a superabundance of food, which they could seize not only at the surface with their wide jaws, but also in the dark depths and in the mud of the shore-line. The latter is clear from a seemingly insignificant condition, that is, the triple rows of nerve-holes lying above one another at the snout, which occur only singly in the related reptiles. These show that numerous nerve branches spread out in the nose and make it suitable for rooting around. This arrangement also allows a conjecture as to the nature of its body skin. The snout cannot have been armored with plates, since their presence would contradict the purpose of the nerve holes. However, if the head, which bears the largest armor plates in the Lacertia, was actually covered with bare skin, then one may conclude that the rest of the body was also not armored, and that the memory of the extinct ichthyosaur from the preceding epoch was renewed, so to speak, in these creatures. This supposition has also not been disproved by any discovery of traces of scales and plates, which could just as well have been preserved in these skeletons as they were in other saurians and in the fish of this same era. excitable nor quick in their movements, and in this respect they lagged behind their relatives of the present era. They seem to have multiplied abundantly. This assumption is, to be sure, contradicted by the rarity of discoveries of their skulls to date; but the stone quarries at Maastricht have already produced so many teeth and vertebrae that most collections have been enriched by them. In the fields near Aachen there are countless fragments of petrified teeth and bones of these creatures lying around, and Prince Maximilian zu Wied reports *) that whole skeletons are not seldom found in the Big Bend area of the Upper Missouri. 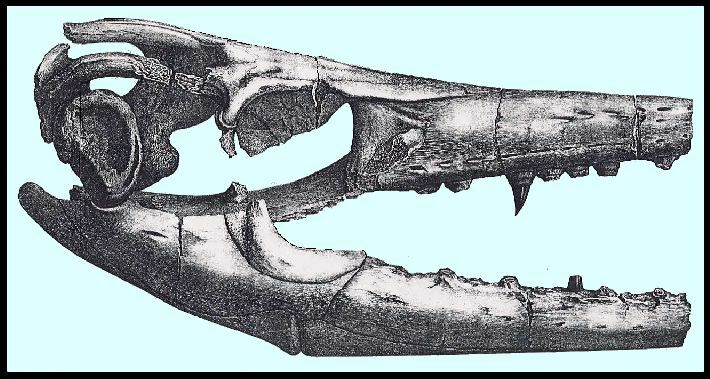 It would be extremely desirable to discover the skulls of the two gigantic contemporaries of our species, the Iguanadon and the Hylaeosaurus, and to investigate whether such skulls would display similar anomalies in their structure. But even lacking detailed knowledge of them, it is already clear that with the Cretaceous Period there came a turning point in the development of saurians. To be sure, Nature was still producing colossal forms, but at the same time was introducing the seeds which led ultimately, after many changes of direction, to the more delicate forms which now predominate. *) Journeys, Vol. II, p. 78. The skull from above, life size. The same from the side, with the lower jaw. The lower side of the skull. The following abbreviations are identical in all three of these plates. p. 180, line 4. Replace "Sm." with "Jm." Tab. VII (Plate 7) The right side of the skull and lower jaw. Tab. IX (Plate 9) Details of teeth and other parts of the specimen, including the paired pterygoid bones. Cuvier, G., 1834-1836. Recherches sur les ossements fossiles, 4th. ed., Paris, 10 vols. Credits: I am indebted to Dr. Robert T. Firestone (ret. ), University of Colorado in Boulder, CO (Dept. 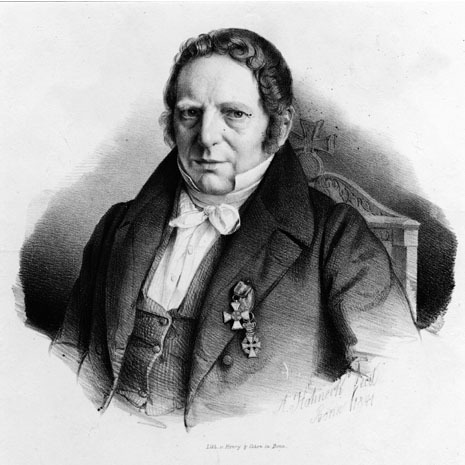 of Germanic and Slavic Languages) for his excellent translation of Goldfuss (1845). I also thank Earl Manning, (Tulane University, New Orleans) for his critical review of the material presented on this page, and his suggestions for improving the readability of the English version.